Hygiene is an important element for your dogs. From taking care of the paws, to the skin, and even to taking care of your dog’s hair, all of these pertinent details are essential to ensure that your dog is well taken cared of. In order to fully take care of your dog’s hair and fur needs, you need to have the best dog brush for labs. That being said, here are some of the things that you need to do to fully take care of your dogs and keep them groomed for life. What is the Right Brush for My Labrador? It is important to keep your dog looking great, neat and tidy. However, to achieve that might be easier said than done. Also, if you don’t have the right tools, getting the task done would be harder. To put it simply, you need to have the right and the best dog brush for labs that are available in the market today. Even though it can be tempting to buy the first dog brush that you see, try to avoid that urge because you might have to spend more and ultimately lose your money. To prevent yourself from wasting money, you need to know that there are a variety as well as different types of dog brushes and it works well on the type of breed or the style of the dogs. For labradors, its double coat will show you how difficult it can be, but with the right tools, the grooming can be done. You should know that dogs may require different types of brushes. The brush of the Poodle would not work well to a German Shepherd or to a labrador because the hairs are very different. If you use the right dog brush, your pet will be groomed well. However, if your dog shows any signs or discomfort or even pain, try changing your dog brush. If the dog seems to enjoy the grooming time, then that brush works well with your dog. There are different types of brushes and knowing more about them can help you in choosing the right fit or the right brush for your labrador. In order to get the best dog brush for labs, consider these different types and assess it in order to get the right one for your dog. The slicker brushes features a fine, short wires that are knitted together. It works well for medium haired dogs or curly-haired dogs as well as remove the mats. However, there are many types of slicker brushes sold in the market today. One of the best ways to choosing the right fit and size is to check the handle’s flexibility so that you groom your dog easily. 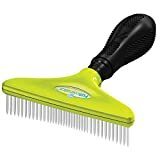 This type of brush works well with Golden Retrievers, Cocker Spaniels, St. Bernards, and even Yorkshire Terriers. Since the longer-haired dogs are prone to develop mats, this brush works effectively to deal with that. 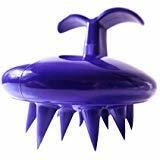 One thing to remember is that when using the slicker brush, you need to be more gentle to your dog. The reason for that is the tightly-spaced wires usually renders discomfort for your dog, especially if too much pressure was applied. ​This type of brush is made to penetrate a dog’s thick coat as well as remove tangles or the dead undercoat found beneath the dog’s skin. It is shaped liked razor blade but it has two rows of pins that are closely binded. These types must be used with minimal pressure, otherwise it would cause a lot of discomfort for your dog. It is effective for use towards thicker haired dogs such as German Shepherds, Chow Chows or Malamutes. Since these breeds are prone to develop dead undercoats during the shedding season, the thick coats basically trap debris and it is difficult to clean or groom them. With the rake brush, the grooming process has just gotten easier. The bristle brushes are ideal to be used on short-haired but smooth-coated dogs. These are the types of dogs that shed frequently. The brush can remove loose hair and stimulate the skin as well. This tool works well on dogs such as Pugs, Boston Terriers, Jack Russell Terriers, and Italian Greyhounds. The pin brushes is similar in form and look to the type of brush that most people commonly used. It is oval shaped in its design, but the flexible wires are loosely arranged along with pin placed on the top part. On a side note, even though the pin brushes are the most commonly used type of brush, it is not that useful. This type of brush is ideal for the experts. It is often used by experienced groomers to take away dead or shedding hair. 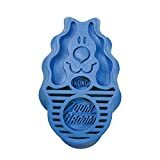 If you don’t know how to use this tool or not familiar with it, don’t use this because it might cause problems for your dog. Remember, it is a part of your duty as a dog owner to keep your labrador presentable even though the job is a tough one. Despite the options of doing it, grooming using brushes are still one of the best ways to do it. Here are some of the things that you must know and consider before buying the grooming tool. Is the price value worth it? You need to consider the price of the grooming gear before buying it. Check first if the product is durable, effective and the value is within range or not too hefty. Sometimes the dog brush could be expensive and yet it is not able to deliver the results that you deserve. How effective is the product for your labrador? Before buying, you need to check if the product is effective for your labrador or not. Since there are different types of dogs, they require different types of brushes as well. You need to find the most effective brush for your labrador and buy that product instead. Do not opt for products that offer a wide range of features and yet fails to deliver. For the labradors, their coats are more tougher, which is why you need to have a product that can clean the thick coats of your labrador and at the same time remove the dirt or debris. If you own a labrador, you must be aware of how active these dogs are and how they love to lie down on muddy trails and get wet. Keeping a close eye on your lab is important to keep them safe and healthy. Moreover, brushing your labrador promotes an opportunity to bond more and spend quality time with your dog as well.When buying the right brush, you need to check the product’s features and check if it could work well with your labrador. You have to confirm if it is able to clean and if can promote health to your dogs in the long run. Some products can even stimulate the natural oils of your labradors, so choose that product as well. Here are some of the types that you can use. You can either get a self-cleaning slicker brush, a bristle brush or an undercoat rake. Moreover, using a Furminator is also a good brush to opt for. On the other hand, to help you in making the right choice and get the best dog brush for lab, browse through the products that we have listed below and select your choice depending in the positive features and the negative features as well. If you are in need of a brush that is able to deliver the de-shedding grooming that you need, you can get the FURminator deshedding gear. The product is able to prevent hair loss which is on your dog. It also has a button feature that could remove loose hair off your brush. The brush is easy to use and control. It is truly the perfect tool for de-shedding. For some users, it is better than using a rake or a comb. With its stainless steel edge, it can reach further down the dog’s coat. The Zoom Groom brush is known for its effectiveness in grooming your labrador. It is rated 4.7 out of 5. The product helps in removing dead hair from your dog’s coat. It is also used in a thick coat. This brush also eliminates tangling at high potency. To use this product, you don’t have to use a lot of energy to groom your labrador. Moreover, this product is easy to hold, it is durable and sturdy. It also promotes a comfortable grip and increases blood circulation for your dog. If you want more comfort, you need to get the Better Petter Dog & Cat Deshedding Glove Brush. It is the right product for you. It is gentle on your labrador but provides stella cleaning features too. Also, you can take away the loose hair on your dog’s undercoat. Features a nylon coated tip. This type of bristle brush is known for its efficiency. It features an exquisite wooden handle that promotes comfort when brushing your labrador. It basically functions to remove dirt on the coat. In addition, the wooden handle is a good element because it makes the grooming easier and hassle-free. To put it simply, you can groom your dog without any additional effort or strength. This product works well with other dog types such as the golden retriever, the Labrador retriever, or the Irish settlers. The product is also durable in nature, and you can comb or brush without experiencing any form of irritation. Do not work well for dogs with lots of hair. The FURminator is known as one of the best among the best. It is a rake brush that offers high-quality grooming for your labrador. The results are also stellar because it provides professional results despite doing the grooming at the comfort of your own home. It keeps your clean and hygienic without using water. Also, the brush is able to reduce hair shedding up to 90% because the rake can even reach under the topcoat of your labrador. Ideal product to remove the mats. As a final say, it is essential to ensure that your dogs are well taken cared of. It can be done by brushing the coats and remove the dirt or debris. With the five products mentioned above, you can opt for the Zoom Groom, FURminator DeShedding Tool for Dogs or the Better Petter Dog & Cat Deshedding Glove Brush. However, the final decision still up to you. The three products were handpicked because of its efficiency to groom your labrador. If you have used the mentioned products before, feel free to leave some comments below and give us the product that worked best with you. Looking forward to hearing your experience regarding the dog brush that you have used in the past until today.